Hi, there's something wrong lately. I updated the itch.io desktop app and now it just will not run this game, or even redownload or install it. It just keeps saying "No compatible Uploads found." I liked it. The difficulty is a bit unpredictable due to the random items (on my first run, I had trouble with the fights pretty soon) and it's a bit hard to keep track of all the characters, but the setting, the NES-like artwork and the music is pretty compelling. The game crashed and since I hadn't saved for a few minutes, I restarted from the beginning. I played my second run until the timer ran out. 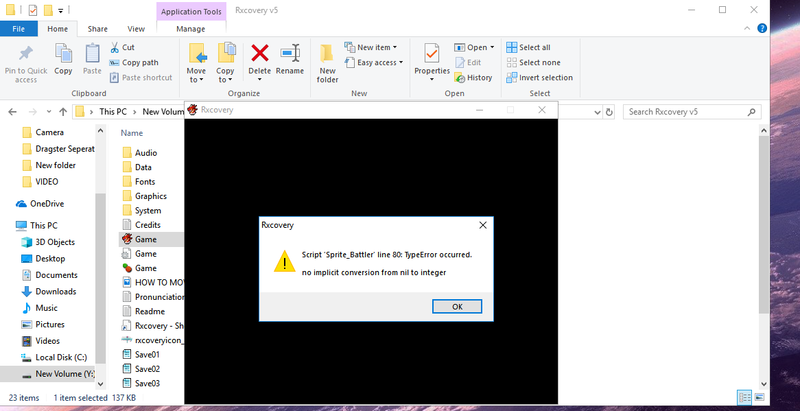 When it asked me to save, I did so and the New Game+ option appeared. However, when I try to start a NG+, it just takes me to a black map with the countdown at 00:00 and a game over screen shortly after that...so I guess my save file is unusable now. Since I lost a lot of progress, I probably won't play any further, but other than that, I enjoyed Rxcovery and would definitely play a sequel! The New Game + prompt only happens when the timer runs out! Be sure to save your game and choose the "New Game +" option when it appears. That is an incredible compliment!! Thanks so much! I hope you do make games - it's heartbreaking work, but also a lot of fun! I really liked watching your playthrough of it too! it took me quite a few days to finish this game all the way through. I thought it was near impossible to get 400,00 dream dollars but yet, here I am. all I have to stay is: THIS GAME WAS AMAZING!! i'm constantly looking for good rpgs and this one is just awesome! I love the music, I love the characters and the story is just awesome. I would like to thank you for making this game and I hope you keep making more like it. Played for 25 minutes of the timer and I'm in love with this game so far!! My only complaint is that it isn't that clear to me which elements are each monster. :|c Am I missing something or should I just watch their spells closely? The monsters are sort of color-coded, and have the element in their name - Devil element monsters hjave "Devil" in their name and are purple, Slime element monsters are green and have "Slime" in their name, etc. The monster names are kind of nonsense so it's a bit abstract, but it's there! What platforms is this game for? Itch says it isn't available on Windows but I can't see a listing of what platforms it uses. part 2 I really L.O.V.E. (see what i did there?) what you did with this game. It has everything you would want in a retro 8bit RPG! 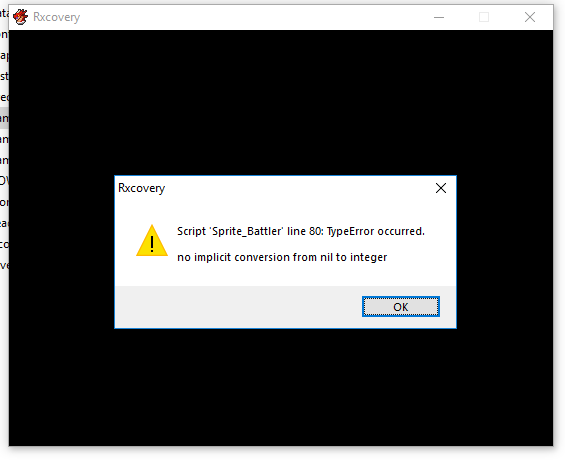 "Script 'Sprite_Battler' line 80 TypeError occurred. no implicit conversion from nil to integer"
I got this point this morning with v4.2 and then saw that version 5 was released and was excited assuming this may fix the bug. However, the game still crashes. Otherwise, I really enjoyed this game. Who is in your party when this happens? Does it happen with other battles, or just this one? Amazing game it's an easy to play RPG that takes level grinding and, actually makes it fun! The background tracks are incredible and, I enjoy how they change instead of it just being a constant over and, over! I just downloaded your game and have been playing a bit. I am not sure how the New Game+ you mentioned works though. When I die and get the game over screen, am I supposed to press something? It throws me to the original screen with options 'New,' 'Load,' and 'Quit.' Selecting new just starts the game all over from the very beginning, and well, the others don't help either. you only get the new game + option when your 30 minutes are up. You're taken to a save screen where you save your game, and then the "load" option in the save menu is replaced with "new game +" for that one save. Dying in battle doesn't trigger this option. Oh that makes more sense...seems it may require more of a time commitment than I first figured. Thanks. Okay y'all, try it now! Script 'Yanfly Ace Equip Engine' line 725: NoMethodError occured. Responding to say the same as jinxedcross, the game crashes during the next battle after Blue joins, even if he's not in combat. Testing again to be thorough, it seems to be Lyubova using the Jewel Knife skill which causes the game to crash, not Blue's fault. As a heads up, after getting Blue and entering a battle, I've gotten a "Script 'Kread EX-Glimmer' line 210 ArgumentError occured. Comparison of Fixnum with nil Failed." before it would shut down the game.